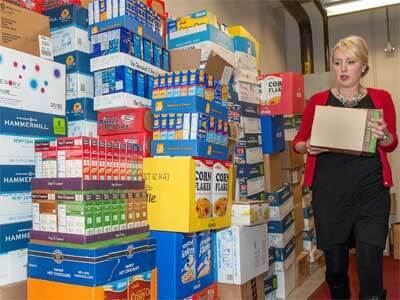 the mountain of non-perishables ready for donation to the food bank. The results of the NIU College of Business Food Drive challenge will be kept under lock and key until January, but the clear winners were the needy of northern Illinois. Spurred on by the chance to win the coveted Golden Can plaque that is awarded to the winning department, faculty and staff across the college donated an impressive 261 boxes of food. All of the food was donated to the Northern Illinois Food Bank, which serves 13 counties across the region, including DeKalb. The food drive has been sponsored for five years by the college’s Staff Council, which is comprised of representatives from Operating Staff and Supportive Professional Staff. 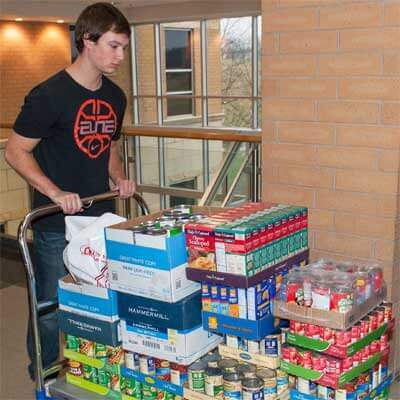 To put this year’s success in perspective, last year’s contest resulted in 96 boxes of food collected. Not that last year’s haul was anything to sneeze at: It was good enough that project organizer Angie Euhus, office manager for the Mangement Department, originally set a goal of 100 boxes of food this year, and 100 percent participation by all faculty and staff in the college. To even the playing field, smaller departments were partnered up with larger units. While the competition officially ran from Nov. 1 through Nov. 18, rumor has it that some departments in the college had been hoarding non-perishable food for months. They stashed food in broom closets, offices, conference rooms and any other out-of-sight location that could be found in an attempt to decoy other departments into believing that collections were going slowly. Along the way, the drive inspired some creative thinking and generosity. Dean Denise Schoenbachler stopped giving away the farm-fresh eggs from her own chickens, instead trading them only for donations to her office’s food drive stash. By the time of the final tally, her office averaged 5.2 boxes (a box was a standard copier paper box) donated per person. In the of Accountancy Department, an alum who saw the more than 30 boxes that employees had collected donated $100 to help the cause. Staff in the college’s MBA office got students involved when the department’s three staffers offered to match any and all donations brought in by the program’s 30 students. Last Thursday, everyone had to show their hand as representatives from the Staff Council tallied up the final haul. “We had a lot of help. We had people in every department making sure that we counted every single box and got it noted down right,” Euhus said with a laugh as she oversaw volunteers moving boxes filled with canned soup, vegetables, Ramen noodles, oatmeal, pasta and all manner of other non-perishables to the Barsema Hall loading dock. The outpouring of generosity didn’t surprise Schoenbachler, for one. “Business people are incredibly competitive,” she said. “But I think they were motivated by the cause, it’s all about making a difference in the community. In an unrelated – but also successful – event, members of the college’s social entrepreneurship student organization, NIU CAUSE, held a pizza fundraiser. They sold, baked and delivered 41 pizzas during their Nov. 21 Eat for a Cause event and raised enough money for the Northern Illinois Food bank to provide 3,305 meals to people in need – triple their original goal.